France's head of the armed forces has resigned days after President Emmanuel Macron publicly rebuked him in a bitter clash over plans to slash the military's budget by €850m in the first major test of the young presidency. General Pierre de Villiers said if the budget cuts went through it would leave him in charge of an army "no longer able to guarantee the robust defence force I believe is necessary to guarantee the protection of France and the French people, today and tomorrow". As a result, the five-star general tendered his resignation to the newly elected centrist president and it had been accepted, he said in a statement. The resignation is the first sign of fierce opposition the government is likely to face as it tries to cut €4.5bn in spending by the end of the year to honour its pledge to bring its overall deficit under 3pc of GDP as required under EU budget rules. The row between Mr Macron (39) and General de Villiers (60) erupted late last week when the furious chief-of-staff told a parliamentary defence committee he would not sit idly by while the armed forces were "screwed" by the drastic cuts ordered by the finance ministry. The planned cuts, predominantly by saving money on equipment, total around €850m. 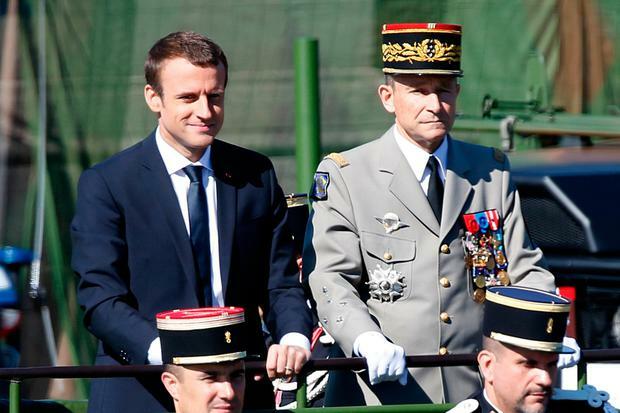 Livid, Mr Macron chose to respond publicly while addressing troops on the eve of the annual Bastille Day military parade that was attended by US President Donald Trump. Reminding them he was constitutionally the supreme commander of France's armed forces, he said: "I am your chief. I don't need any pressure or commentary." To ram home his point, Mr Macron then said in a newspaper interview at the weekend that if there was a difference of opinion, "it is the chief of the defence staff who will change his position". The clash sparked a heated political debate over whether the president had overstepped the mark and humiliated his military chief or had little choice but to assert his authority after taking a difficult decision on cuts across the board. The president later announced a €1.5bn rise in military spending for next year - in line with his campaign promise to boost defence spending to 2pc of GDP by 2025 as part of France's commitments to Nato. But that apparently failed to mollify the straight-talking General de Villiers, who served in Kosovo and Afghanistan and is widely liked by the rank and file. The head of the French military since 2014, Gen de Villiers insisted that it was his "duty" to express his concerns about military resources amid the threat of extremist attacks. "I have always taken care... to maintain a military model that guarantees the coherence between the threats that weigh on France and Europe, the missions of our armies that don't stop growing, and the necessary budget means to fulfil them," he said in his statement. The row has brought to a head an early test of the newly elected president's mettle. Yesterday, Mr Macron moved quickly to replace him after his resignation, appointing General François Lecointre (55) to fill the role. "It is clear today that the executive cannot bear a situation where its top public servants have a view of things that is different from the political view put together by the Elysée," said General Vincent Desportes, former head of France's top military school. "It's not Erdoganism, but it is not far off," he added in a reference to the Turkish President Tayyip Erdogan, who faces accusations from opposition leaders of being a dictator in the aftermath of last year's failed military coup. Those remarks were echoed by opposition politicians such as Damien Abad, a member of Les Républicains party, who sits on the parliamentary defence committee. He tweeted that Mr Macron's "excessive authoritarianism led to the resignation." Marine Le Pen, the far-right leader whom Mr Macron beat in the presidential run-off, said the French military had lost "a man of huge value" and claimed the resignation showed "the very serious abuses and worrying limits" of the president's leadership. Nataliya Vasilyeva Comedian Volodymyr Zelenskiy has been given an overwhelming directive for change after collecting more than 70pc of votes in the Ukrainian presidential election.